Some things ln life just have to happen. Kids have to grow up, car tanks have to be filled with gas, Santa has to put presents in our stockings (thank God phones fit in there! 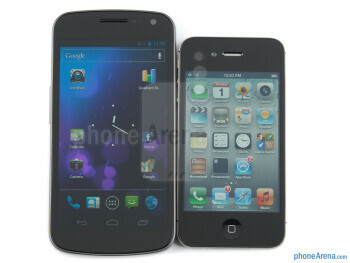 ), Lady Gaga has to top the charts, and the Galaxy Nexus has to be compared to the iPhone 4S. It's inevitable! And since we happen to not be so concerned with Gaga, and (most of us) don't have kids yet, how about shifting our focus towards that smartphone comparison thing? 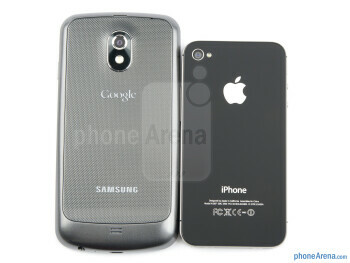 Now that we've closely examined the Galaxy Nexus and the Galaxy S II side by side, and determined that Google's latest and greatest does indeed set new standards with its redesigned software platform and beautiful screen, it seems like the next logical step for us is to set the stage for a nice tactical fight between the new Nexus and the overly-polished iPhone 4S. Which one will come out on top? Read on to find out! Place these handsets next to each other and it immediately becomes obvious that much more thought has gone into the design and execution of the iPhone 4S. This phone continues to be one of the very best offerings in terms of appearance and construction. Not only does it look beautiful, but it's also made from premium materials like glass and steel – no plastic whatsoever. Meanwhile, the Galaxy Nexus is a typical Samsung phone, being made from plastic, and having this characteristic bump on the bottom of its back side. It is pretty light for its size, but this doesn't make up for the fact that the handset doesn't have a classy feel when held. Thankfully, it doesn't feel cheap either. 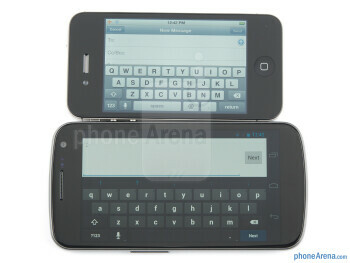 One of the most obvious differentiating factors in terms of design are the dimensions of the Galaxy Nexus and iPhone 4S. Honestly, if you don't like having to carry around a very large smartphone, the iPhone 4S will be the better option due to its significantly more compact body.